Molino Charrara: If you are looking for Bed and Breakfast in Murcia then Hospederia Molino Charrara is the place, a photo by totemtoeren on Flickr. If you are looking for Bed and Breakfast in Murcia then Hospederia Molino Charrara is the place. Located at the head of the Rambla Benito in the Campo de Ricote this 19th century *Bucket Mill* offers a rustic and friendly place to stay with English, German and Spanish speaking staff. Playing an important role in war time and through the black market helping to feed the local people, the house has been completely rebuilt respecting the original building elements using furniture and rustic decor and now under new management offers a family atmosphere in total harmony with the environment of rural milling. The Region of Murcia enjoys a Mediterranean climate of a semi arid type with mild winters and warm summers. 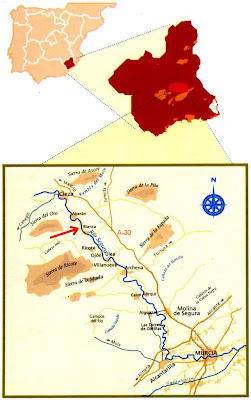 The Ricote Valley is one of the most beautiful and little-known areas of the fertile plains of the great river Segura which runs through the heart of Murcia. Here you can soak up the remnants of Islamic culture, for the Ricote Valley was the last bastion of the Moors in south-eastern Spain where the Mudejares remained until 1614. For those of you who want a different holiday in Spain and a break from the beach this area offers many different ways to enjoy rural Spain but with beaches just an hour away you can still enjoy a holiday with a difference.